Clemantine Wamariya is a storyteller and human rights advocate. Born in Kigali, Rwanda, displaced by conflict, Clemantine migrated throughout seven African countries as a child. At age twelve, she was granted refugee status in the United States and went on to receive a BA in Comparative Literature from Yale University. She lives in San Francisco. Elizabeth Weil is a writer-at-large for The New York Times Magazine, a contributing editor to Outside magazine, and writes frequently for Vogue and other publications. She is the recipient of a New York Press Club Award for her feature reporting, a Lowell Thomas Award for her travel writing, and a GLAAD Award for her coverage of LGBT issues. In addition, her work has been a finalist for a National Magazine Award, a James Beard Award, and a Dart Award for coverage of trauma. She lives in San Francisco with her husband and two daughters. "Like Ishmael Beah’s A Long Way Gone, on being a boy soldier in Sierra Leone, or Joseph Kim’s Under the Same Sky, on escaping North Korea, The Girl Who Smiled Beads is at once terrifying and life-affirming. And like those memoirs, it painstakingly describes the human cost of war." "Wamariya’s memoir proves how the human spirit can triumph. It truly floored me." "Gripping.... It is our human tragedy that there will always be war, and that there will always be displaced people. Memoirs that show exactly what that means, exactly what the toll is, are vital." 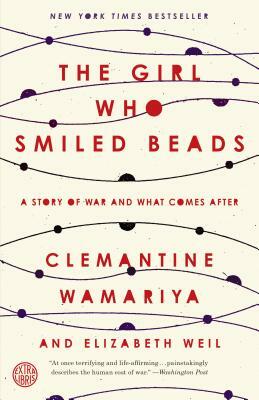 "In this eloquent and engaging memoir, Clemantine Wamariya recalls a childhood spent as a refugee on the run from war, violence, and terror, and a womanhood shaped by those experiences. Affecting and utterly eye-opening, The Girl Who Smiled Beads is a powerful reminder of just how strong and indomitable the human spirit can be." "Lyrical and hauntingly beautiful. The Girl Who Smiled Beads will inspire you."